This guide looks at all of the different types of bid adjustments, how they work and probably most importantly how they work together. Bid adjustments are a powerful tool that everyone advertising through AdWords should be aware of. Bid adjustments allow you to optimise bids based on when and where those bids are being applied. For example, you can adjust bids based on the time of day or day or the week if you have identified more valuable or less valuable times. Adjusting bids is not limited to just times, we cover all of the different types of bid adjustments available later in this guide. Bid adjustments give you a more granular control over your bids and allow you to make small or large tweaks to take advantage of opportunities or avoid wasted spend. For example, if mobile traffic typically underperforms on some campaigns; you can down bid the mobile traffic through making a bid adjustment. Conversely if you would like to reduce a bid from $1 to $0.70 you would apply a negative bid adjustment of -30%. 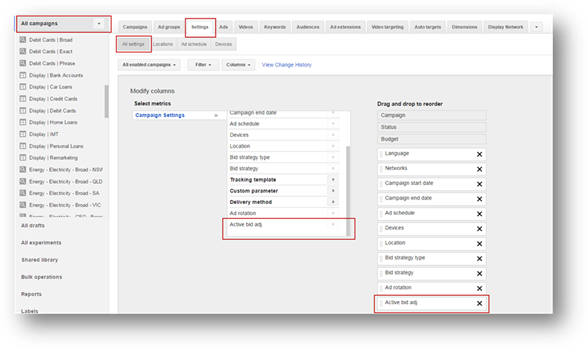 There are six types of bid adjustment available within AdWords, each of which are described in more detail below. Mobile bid adjustments allow you to increase or decrease bids on mobile devices. This feature essentially replaces the old campaign format that was proceeded by ‘enhanced campaigns’. Previously advertisers could create campaigns to target specific devices, since then we are left with the rather clunky ‘mobile bid adjustments’ with which to manage mobile device bidding. At the time of writing this feature has been announced but is not currently available, but this feature is coming out soon and will work in the same way as mobile bid adjustments. Locations can be added to campaigns and this includes sub regions of larger regions, for example; you could target the whole of Australia and all of the states… Although this doesn’t increase the pool of available users to target, it does provide you with data about users in those regions. When you add multiple locations, you can see how each one performs and you can then set bid adjustments based on that performance. If for example you have a CPA (Cost Per Acquisition) target of $50, you may find that some locations come in under and some over CPA target, you can set bid adjustments for each location to raise or lower bids to bring the CPA in line with targets at a more granular level. This enables you to unlock additional traffic from high performing locations and reduce traffic from low performing locations. Ad scheduling allows you to increase or decrease bids for specific times of day or days of the week. You will need to analyse your data to establish where the opportunity for each campaign exists… If you notice that between 3pm and 7pm you receive higher conversion rates or better ROI you may want to increase bids during these times. Conversely you may also notice that on Fridays, the commercial intent of users is much lower resulting in consistently high traffic but lower conversion rates. Ad Scheduling bid adjustments allow you to capitalise on opportunity and minimise wasted spend, creating a double pronged approach to account optimisation. We talk about how to set bid adjustments at the end of this guide. This is only available for ad groups within Display & YouTube campaigns… The AdWords system measures some content to be more valuable as this typically gets the majority of the impressions, clicks and engagement. Google will use your bid adjustments to raise your bid on the more valuable content. 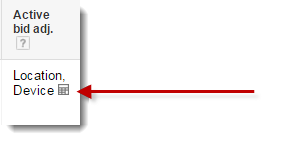 RSLA is a powerful feature that allows you to add remarketing lists to your Search Campaigns allowing you to target people in the list/s added in one of two ways. The mechanism for bidding on RLSA is managed through a bid adjustment to the existing ad group default bid. This enables you to, for example, increase bids (through bid adjustments) for users who have previously visited your website. 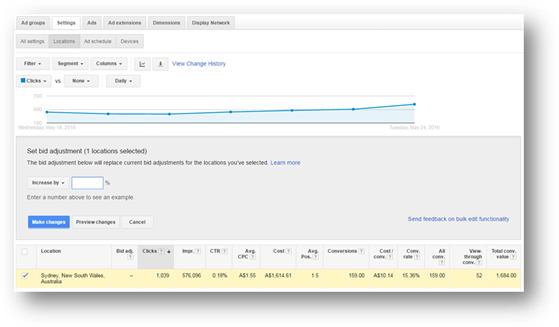 This can be particularly useful if your returning paid search visitors are more likely to convert and leads naturally to performing some attribution modelling to understand the value of clicks throughout the click to conversion funnel. If you are using automatic bidding on a campaign, this prevents ad scheduling bid adjustments from working / being applied. On campaigns using conversion optimiser, you can only use a -100% bid adjustment but no other value will be applied. Because bid adjustments can be applied at different levels throughout the account and affect different components it is important to understand how these work together. Scenario 1: Mobile bid adjustments are set at both campaign and ad group level. In this scenario the ad group level bid adjustment will be applied and the campaign level adjustment will be ignored. Scenario 2: This is the same as scenario 1, except that the campaign level bid adjustment is -100%. In this case the campaign level bid adjustment will be used and no mobile traffic will be delivered by this campaign or its ad groups. As we explained earlier in this guide, you can add sub regions of the primary target region as locations. If you set a bid adjustment for a location such as Australia and another for Sydney, it will be the most granular level (the sub region) that takes precedence. The more specific region’s will always be the bid adjustment will be used. In instances where you are targeted to a CPA, ROAS, ROI, or if you are trying to create a specific mix of desktop to mobile traffic for example, you will more than likely need a formulaic approach. What we mean by this is that you can apply a mathematical formula to the data in order calculate what the necessary bid adjustments needs to be to achieve your target. So by setting a bid adjustment to -16.67%, you will bring the CPC down enough to hit your target CPA of $50. The experimental approach should still be scientific but instead of applying a mathematical formula you apply small incremental changes to bid adjustments; measuring the results and making more changes. Typically, this is a strategically driven approach that aims to test / experiment to see how changes affect performance.